Texas Pete - Texas Giant. "This picture is from about 1908 and all it has is 'TEXAS PETE' in old pencil on back." 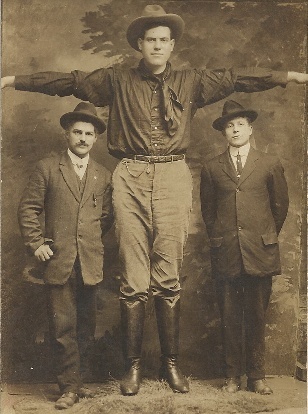 Seeking Information on "Texas Pete"
A recent acquisition and addition to the ever-expanding Beauchamp Photographic Postcard Collection is this 1908 postcard of three men. Only the date and the words "Texas Pete" appear. It is reasonably safe to assume that Texas Pete would be the gentleman in the center.